LIFE believes in the ability of people to find the solutions they need in their community, and we will support them by giving them local control and a direct distribution of Income Taxes. Every Community of at least 10,000 people will be given the right to establish their own Community Assembly and take control of their spending, budgets and services. Using their per person WellFair Support Grant, each Community will be responsible for delivering a basic standard of life to all its citizens based on the WellFair Charter. A Community is the human-scale level of organisation: small enough to be accountable, and large enough to be practical. To provide a firm foundation for the democratic accountability and local control needed for our sustainable future the citizens of the UK will divide themselves up into Communities with boundaries they decide for themselves. have between 10,000 and 100,000 citizens. have an elected Assembly of full time, paid representatives. be capable of delivering the WellFair services to its citizens. Communities will be the primary agency responsible for the delivery of WellFair services. This is a major responsibility, and the size of the task should discourage the formation of very small Communities; however allowance has to be made for sparsely populated rural communities where the effective population will be at the lower end of the range. Additional responsibilities will include housing, waste management, waste collection, local tax collection, education, libraries, social services, transport, planning, consumer protection, licensing, cemeteries and crematoria, police and fire. Communities will be able to deliver the WellFair services themselves or contract for their delivery from Councils, or other organisations as they see fit. Councils will be converted into service delivery organisations, with Communities as their customers. Initially all Communities will inherit the current legal status of their populations, and that includes the right to free movement. The current arrangements for immigration force local communities to deal with the effects of nationally, and even continentally, decided immigration policies. LIFE will rebalance this by investing decision making power at the same level that experiences the consequences: the Community. After the 2020 elections, each Community in the UK will have the responsibility to determine its own citizenship. Immigration will become a Community responsibility, and will include whether or not to grant residency to anyone from outside the Community. Communities will be able to restrict access to their WellFair services to their legal residents. The Democracy & Freedom Bill will stipulate the maximum length of residency, 5 years, that automatically converts to citizenship. The sensible outcome will be that UK citizens retain their right to freedom of movement, and their right to resettle anywhere in the country without permission. However it is an important point of principle that Communities have control over and responsibility for their resident population, and those Communities that wish to retrieve sovereignty in this will have a means to do so. We anticipate that a lively public debate on this issue leading up to 2020 will contribute to a sensible conclusion. In the Democracy & Freedom Bill, elected Councillors will be replaced by Community Assemblies. Community residents will elect full time, well paid Assembly members, who will submit to re-election no longer than every 3 years. Assembly members will be paid 5X the Community’s median earnings. This gives local people control, and ensures high caliber candidates stand for Assembly election. The first term of each Community Assembly will be shortened to 2 years to accelerate the adoption of Regional affiliations. The boundary of each Community is decided by the citizen-residents of the property they occupy. Most people can immediately identify the “community” to which they belong, whether they live in a rural or urban area. Each citizen-resident can select their Community membership with the proviso that their property must be physically adjacent to another property in the same Community. The initial selection process will happen over the first 18 months of the first parliament. The Boundary Commission will be charged with oversight of the process, and the production of provisional maps every two months. A final selection vote will be held in the first half of 2017. After the initial selection a citizen-resident can only change their Community membership after the next UK General Election, and even then only once in the term of a single Community Assembly. The boundaries of Regions will be defined by the boundaries of the Communities that choose to form the Region. As with citizen-resident selections, Communities can only join Regions with which they have a physical border. Communities will select their Regional affiliation after electing their first Assembly and the completion of that Assembly’s first (shortened) first term of 2 years. The Boundary Commission charged with oversight of the process, and the production of provisional maps every two months. A final selection vote will be held in the last half of 2019. The only effective way to deliver high quality essential services that actually address the specific and particular needs of the people, is to deliver those services locally. Local knowledge of the specific service delivery challenges and opportunities, and of the local population’s specific needs cannot be substituted. This makes it essential that we have accountable and effective local government. We can start by building Community Centres in every community that are the focal point of WellFair services. A community kitchen can cook for the local schools, feed the housebound elderly, the sick and the destitute. It can do this with local food and, at the same time, provide training and employment. One of the 10 recommendations for better government in the IPPR report of August 2013 is “6. Co-locate the public estate”, and it specifically calls for the kind of multi-function community centre we see as vital to the efficient and effective delivery of WellFair services. 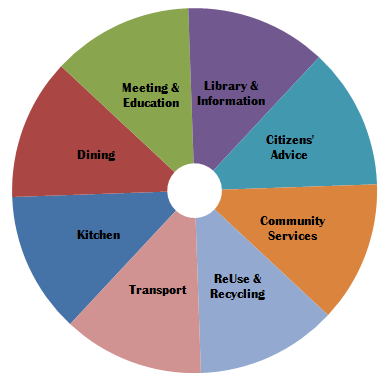 Initial modelling of WellFair service delivery suggests that significant efficiencies will be derived by using a service hub in each community, the Community Centre. The same IPPR report recommends “4. Combine functions”, and references estimates of 25% to 35% overlap in current service delivery (Patrick Dunleavy, 2010, Total Place). The LIFE WellFair budget assumes a 10% increase in efficiency, phased in over the first 5 years. While many Communities will be able to repurpose an existing building or church to use as their centre, others may require the construction of a new one. In order to facilitate this the government will solicit, select and approve a set of standardised designs which Communities can adopt, adapt and build. Funding for the building or repurposing of Community Centres will be supported by the National Infrastructure Bank. Communities will receive direct allocations of Income Tax revenues per citizen (WSG – WellFair Support Grant), and from that budget they will be responsible for delivering the seven Wellfair services. Once Communities have established proper local democracy (i.e. completed their first elections), they may also levy local taxes (property, council, rates or sales taxes) to supplement the money they receive from the State Income Tax distribution. After the first election of a Community Assembly, that Assembly will be able to set local Property Tax (used to be called ‘Council Tax’) rates. After their second election Community Assemblies will be able to set the rate of all local taxes, including local property, local sales and local income taxes. Any taxes levied locally by a Community are in addition to National Income Tax and VAT. All local tax revenues belong to and are the responsibility of the local Community Assembly. Communities can leverage HMRC to collect local Income taxes, but must pay HMRC’s costs for providing this service.